Tall God Bless America Candle. The song was first written by Iriving Berlin during the summer 1918 at Camp Upton. In 1938 war was breaking out in Europe, Berlin decided to write a "peace song". He recalled his "God Bless America" and introduced the revised "God Bless America" during a radio broad cast with singer Kate Smith. The rest is history. 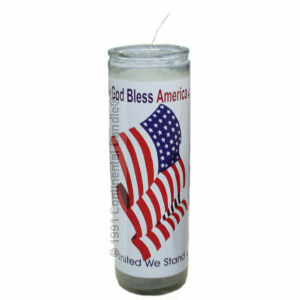 "God Bless America" is manufactured by Continental Candle Company using high quality wax and 100% cotton wick. Made, of course, in the U.S.A.